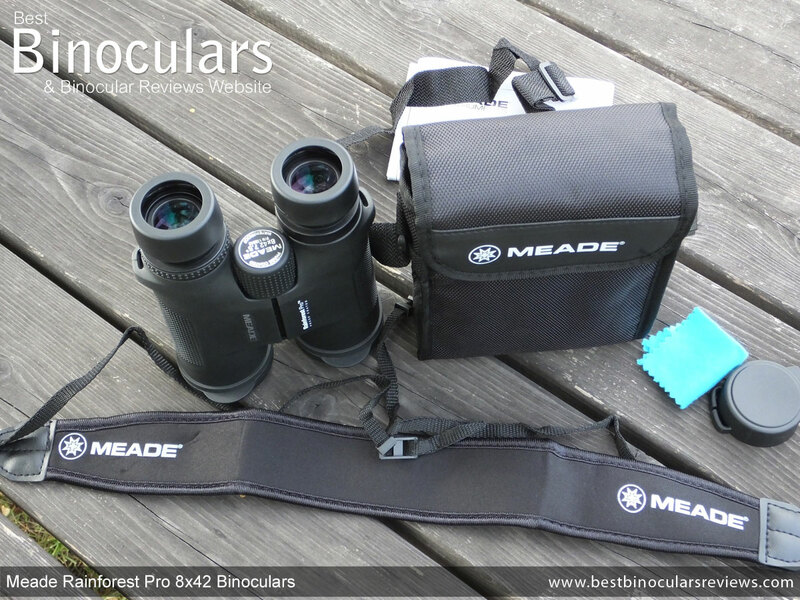 I think it is fair to say that whilst Meade Instruments is a very well recognized and respected brand in astronomy circles, they are far less known for their range of terrestrial optics and in particular binoculars. So whilst I have used their telescopes on many occasions, up until now, I had never had the chance to fully test and then go onto review a pair of Meade binoculars. Thus when their UK distributors reached out to me, I jumped at the chance to give them a try. To start with I decided to test out what I assume is probably their most popular model, the Meade Rainforest Pro 8x42 binoculars. 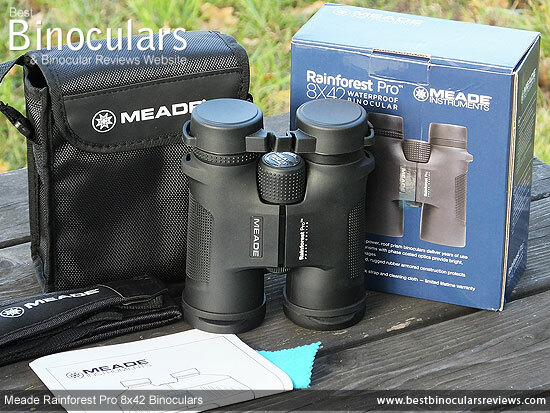 Mead do make a number binoculars specifically for astronomy, but as you can probably guess by the "Rainforest" in their name this range is designed with more earthly pursuits in mind. At this moment, the Rainforest Pro series currently consists of four models. 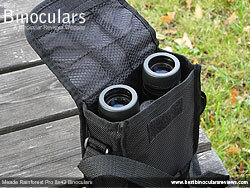 Two mid-sized (8x32 & 10x32) and two full-sized offerings a 10x42 and this 8x42 version. Whilst the Rainforest Pro is also the companies flagship and most expensive range, they are not what I would class as expensive optics. Indeed whilst the RRP of all models within the series put's them just into the mid-range category ($130 - $300 / �130 - �300), at their current retail price, I now classify them in the low cost category ($50 - $130 / �50 - �130). This makes them even more interesting to me. I say this because when first released onto the market, they would (or at least should) have been designed to compete against other bins in their mid-level price range. But now that their prices have dramatically dropped, they potentially have many features and components you would normally not find at this cheaper price level and thus this could make them an excellent value for money purchase. 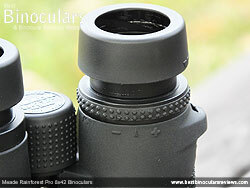 The bridge itself is a little thinner than some and positioned closer to the eyepieces than the objective lenses. This frees up a little space at the barrel ends and can make a good secure and comfortable place to hold onto them when walking about with them in your hand (especially if like me you do not always use the neck strap). The focus wheel is also more encased and protected by the body moulding or to put it another way, it is less exposed than what you usually see, which gives this Meade binocular a sleeker more stealthier look to it that I really like. In keeping with modern trends and for many good reasons, almost the entire exterior consists of a black rubber cover. This chassis armouring is quite thick and hard, which most probably absorbs less energy from impacts and provides less grip than softer rubbers that I occasionally see, but will also most probably be longer lasting and less likely to perish. Meade also counter the less grip of this harder exterior with the deeply dimpled sections on the sides which really do a great job in this regard. At the ends of the barrels, the objective lenses are set to a depth of about 10mm. This covering not only helps prevent sunflairing of the image, but also shelters the lenses from light rain or dust and offers them a degree of protection from scratching. Not mentioned in their marketing, I have been able to ascertain directly from the manufacturers that the majority of the shell on the Rainguard Pro is made from a "lightweight Polycarbonate". This is exactly what I would have expected to discover as it is what the vast majority of it's direct competitors will also have. So whilst Polycarbonate may not quite compare to more expensive materials like aluminium or magnesium in terms of strength, unless you really take it to the extremes it is generally considered to be strong enough with the added bonus of being more lightweight. Remove the cap from the front face of the bridge and it exposes a ¼-inch thread that will accommodate almost all standard tripod adapters. 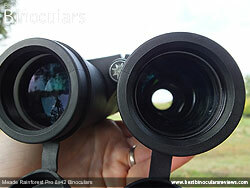 Once fixed to the binocular, you can then fit the adapter to your tripod for completely shake free viewing. Whilst Meade do not quantify it with a recognized standard, these Rainforest Pro bins are advertised as being fully waterproof. They also have airtight seals and during the manufacturing process the internal air is replaced with nitrogen gas. This is moistureless and thus protects the inner lens surfaces from misting up when subjected to rapid temperature variations. Top end instruments will have all metal eyepiece housings and twist up eye-cups and whilst I think these are plastic, they look and feel robust and the twisting mechanism works well with the cups clicking nicely into the three fixed stops (fully retracted, one intermediate and fully retracted). The cups have a hard, but thick rubber covering and are about as comfortable as most others out there so nothing to report either way. Unlike the best quality high end bins that incorporate all metal focus wheels, the one this Meade is plastic like almost all others within this price range. However unlike most in this class that can look rather cheap and sometimes nasty, the etched metal face plate that contains the Mead logo (as well as a few other highlights) and they way Meade Instruments have designed the wheel to sit almost encased within the central bridge and the two barrels gives it a really classy look and in terms of looks is my opinion one of the best out there. A detail that worried me a little about this encased "stealth" design is that because the wheel is less prominent, it could potentially be a little harder to access and thus accurately adjust, especially whilst wearing gloves. However the dimpled rubber track helps counter this and I never had a problem whilst testing - with or without gloves on. The mechanism is what I would describe as being low geared as it takes about 1¾ turns (585°) of the wheel to go from one extreme to the other. In theory this helps to make fine tuning the focus easier than those that are higher geared, but takes more turning and thus is more time consuming to make large focus adjustments. Everyone will have their personal preferences in this regard and I personally like mine to be a little more aggressive, however I really did not have any issue with these. More importantly to me was the fact that the mechanism was perfectly smooth and without any sticking points or areas with free play. I also felt that the resistance to movement on these was just about right (perhaps a the tinniest fraction to tight) so as to make it simple enough to adjust but also make unwanted turning rare. 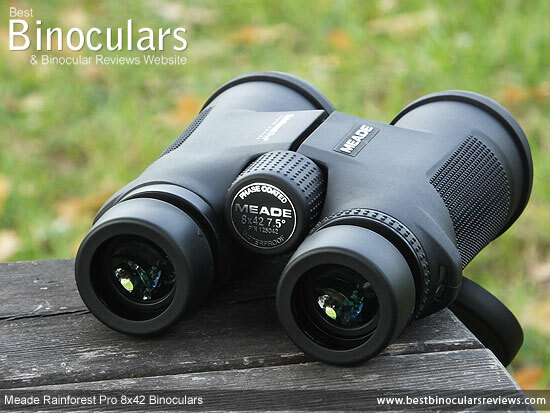 Enabling you to calibrate your binoculars by setting the focus on one side of the bin independently of the left, the diopter is very important for obtaining a sharp image through both barrels (unless your vision is exactly the same on both eyes). 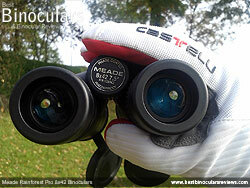 On this Meade binocular this diopter comes in the form of a ring that is positioned just behind the right eye-piece. Whilst it is not lockable, it does have a notched mechanism and enough resistance to movement in order to help prevent accidental movement from your setting occurring too easily. With the central hinge fully closed, I measured the distance between the centers of the ocular lenses to be 5.7cm and with the hinge fully opened it moves out to a maximum 7.5cm. This is a good IPD range and means they should have enough flexibility to accommodate the vast majority of people. Meade Instruments do not supply any information on their website regarding their weight. Update: I have managed to obtain a brochure from Meade which lists them as having a weight of 25.6oz (726g). However my scales measured my sample at just 644g (22.8oz) which is far less. In fact by adding their ocular and objective covers they were 685g and even by including the neckstrap they came in at a much lower 708g. Mead do not advertise their dimensions, but according to my measurements and some confirmation that I later received from Meade Instruments which are listed in the table above, you can see that these Meade Rainforest Pro's are pretty much the normal size of a 42mm roof prism binocular. It is almost impossible to find out the details regarding the make-up of the compound lenses on almost all bins and these Meade's are no exception. What I can say is that the ocular lenses are 22mm in diameter, which is pretty standard for a bin with 42mm objective lenses. 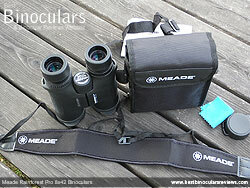 The roof prisms in these Meade Rainforest binoculars are made from BaK-4 glass, which is good, even if as I suspect they are Chinese made as this grade/type of glass is considered by most experts to be a better choice than the BK-7 glass that you will also often find on cheaper instruments like these. Known as 'anti-reflection coatings' it is important to carefully read and establish just how many of the glass surfaces have had this treatment added to them throughout the entire optical path as it really does make a visible difference to the quality and brightness of the view. This is because they play a big part in making sure that as little light as possible gets reflected in an unwanted way and as much passes through the system and onto your eyes as possible. At this level, many bins will be labeled as being "Fully Coated" or "Multi-Coated". This indicates that they have either a single layer coating on every surface or multiple layers on some surfaces respectively. Both these options are better than nothing, but are nowhere near as good as systems like these Mead Rainforest Pro's that have been "Fully Multi-Coated". This tells us that every glass surface from the outer lenses through the whole optical pathway has multiple layer coatings of this material. As yet I have not been able to establish what type of mirror coatings have been used on these bins and I will update this section as soon as I find out. Due to the high level of all the other coatings and glass used, my suspicion is that these will have silver mirror coatings, unlike many in this price level that will use aluminium that is cheaper but has a lower level of transmittance level. 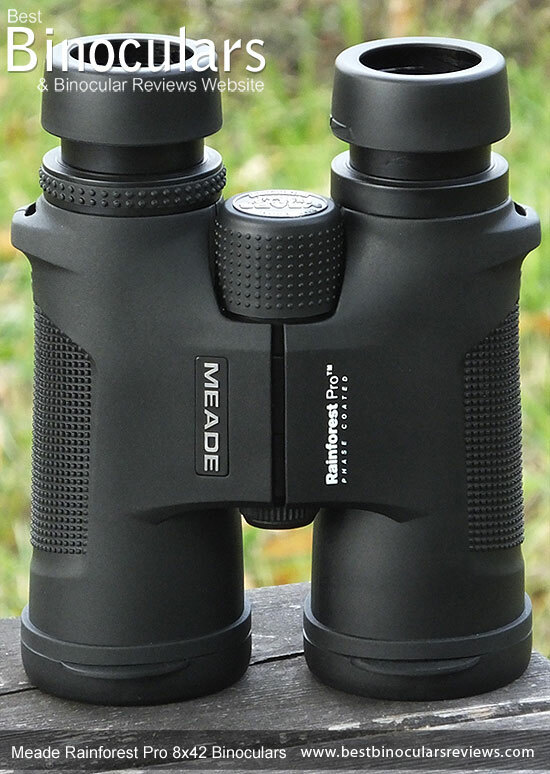 Update - I have received word back from the manufacturers and I can now confirm that these Meade Rainforest Pro 8x42 binoculars do indeed used silver mirror coatings on their prisms which as I had suspected is great news. Aluminium coatings on roof prisms are able to boost the transmittance to between 87% and about 93% (depending on the quality of the coatings and the wavelength of light) which is far better than doing nothing and is what many at this price level will use as it is the cheapest option. The Silver coatings like those used on this Meade improve this reflectivity even further to between 95% and 98%. Note the very best roof prism bins will most often take this even further and use very expensive Dielectric coatings which can take the reflectivity to more than 99%. At this price point, Mead are justifiably proud of the fact that the prisms have phase correction coatings added to them, which if you take a look at the table below is not something that becomes common place until you start paying a lot more. These coatings correct a problem known as phase shift where the different rays of light move slightly out of phase with each other as they pass through the prism and thus these Mead bins will deliver a better resolution image than those that don't have these coatings. 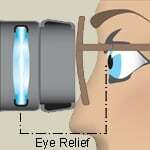 The exit-pupil on an 8x42 binocular is 5.25 (42 � 8 = 5.25), which means that the shaft of light that exiting the ocular lens is 5.25mm in diameter. This is relatively large, meaning that they will provide your eyes with plenty of light in almost all but the very worst conditions and is why this configuration is so widely used. 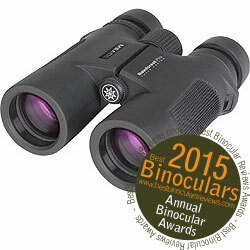 These Meade Rainforest Pro 8x42 binoculars are listed as having a 7.5° field of view. If we project this angle into a distance, it means that the view will be 389ft wide at a distance of 1000 yards, or in metric values, 132 meters wide, 1000 meters away. As you can see from the table below that shows a few selected 8x42 bins that I have tested, their FOV is good and ranks them up in the top third of 8x42's in this regard. 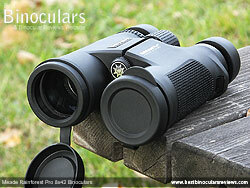 Indeed they also make it onto my list of Wide Angle Binoculars. 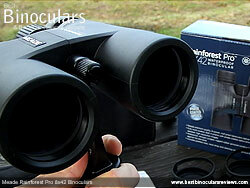 In the Meade Instruments Rainforest Pro brochure the 8x32 model is listed as having a close focus of 2 meters (6.6ft). This is very good and almost what I would describe as being excellent. However if my sample pair is anything to go by, I really do feel they are selling themselves very short and being far too conservative and safe with their "official rating". 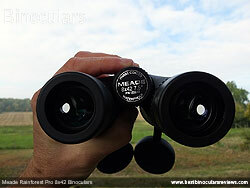 I say this because I measured the closest that I could focus on an object through these at only 1.60m (5.2ft) away. This is superb for an 8x42 binocular and thus makes them a great choice if you also like to observe things like insects and butterflies, flowers and even birds at closer ranges. With 17mm of eye-relief and good quality twist-up eyecups, these Meade binoculars should cater for most and even those who wear glasses whilst binning should be able to get the full field view. I tested this by wearing my sunglasses and sure enough, by fully twisting in the eye-cups easily managed to view a full width image without dark rings forming on the edges (which is what you will see if you don't have enough eye-relief and your eyes are positioned too far back from the ocular lenses because your glasses get in the way). I compared these Meade Rainforest Pro binoculars against my benchmark 8x42s twice, once on an overcast day and then again around sunset when I would describe the ambient light as poor. I could not notice any significant difference in brightness between either of them on either occasion, but if I had to pick one, I would say that my benchmark was the tiniest bit brighter. However to put this into perspective my benchmark is a far more expensive instrument and they have the very best coatings including special dielectric coatings on the prisms. So because they were so close, I rank these as being bright and would say that they deliver a brighter image than what I would have expected at this price level and in my opinion are easily on a par with most mid to higher end instruments. Whilst the colours to me looked neutral and true to real life (some optics, especially cheaper ones can have a tinge to the image because of the cheaper glass used), I would say that to me they were perhaps not quite as vivid as that of my benchmark. The difference was minute however and really nothing that I would be overly concerned with. Whilst the view is nice and bright in all but the very worst light, in my opinion you still get a good level of contrast between dark and light areas. Likewise in very bright light, I never felt that the image was more washed out than what would consider to be normal. 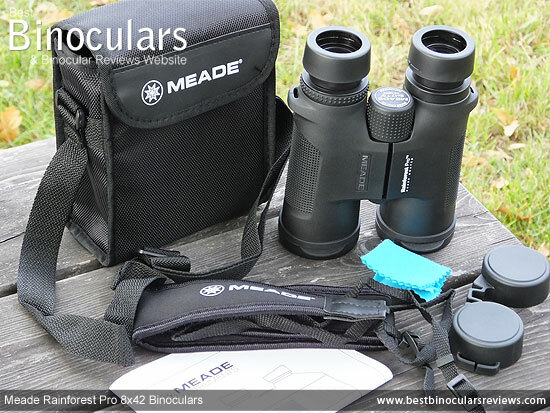 Whilst these Meade binoculars do not contain Extra low dispersion glass that can (if used correctly) further help combat chromatic aberration that causes color fringing, however they will still most certainly have some sort of "normal" low dispersion glass. This along with what is obviously a well designed optical system means that whilst I could see some color fringing, the amount was no more than what I would consider to be normal. Indeed in my opinion these match many bins do contain ED glass in this area, which if you once again consider the price point of these is super impressive. 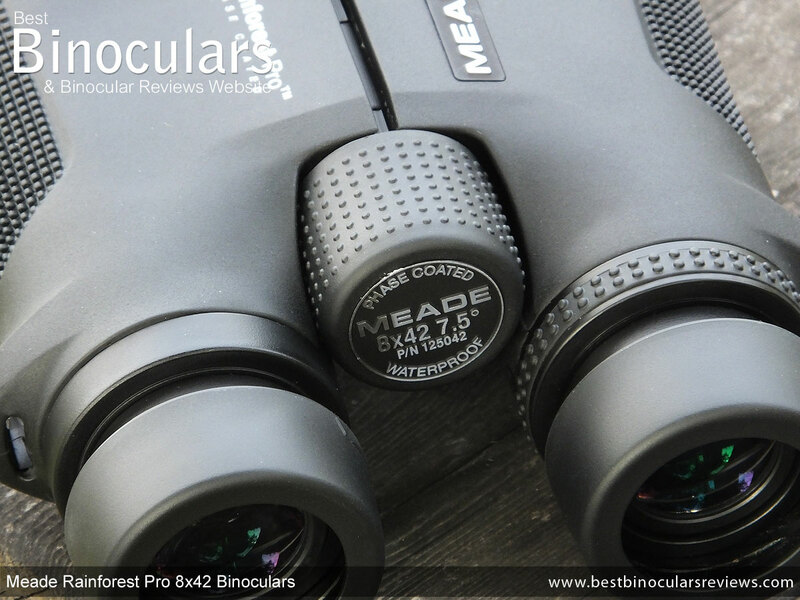 Image softening right on the edges of the view through the Meade 8x42 Rainforest Pro binoculars is very minimal and once again means they will rank amongst the very best in this price level and will equal the better mid and higher level bins out there. In fact I thought they actually had fractionally less softening around the edge of the view than my benchmark that costs many times more than these, which is impressive. As for flatness, I never noticed any abnormal curvature, either in or outwards and so had no issues in this regard. The carry case is made from a good quality woven nylon and so because it is soft and with only a small amount of interior padding it will obviously not provide nearly as much impact protection as a hard case or those with a lot of padding. It will however last, keep the optics clean and offer some protection against wet weather, scratching etc. The flip over flap lid uses a Velcro strip to keep it fastened closed which is quick to open and close, but not quite as secure as a Zip. It can also make a startling sound when you rip it open, which for some uses and situations where stealth is imperative, this is a small, but nevertheless important point to keep in mind. I like the inclusion of a separate netted pocket on the interior surface of the flap, which is a great place to keep a few small items like cleaning materials. The case includes it's own un-padded carry strap that can be length adjusted, but cannot be removed. On the rear there is also a belt loop for additional carrying options. 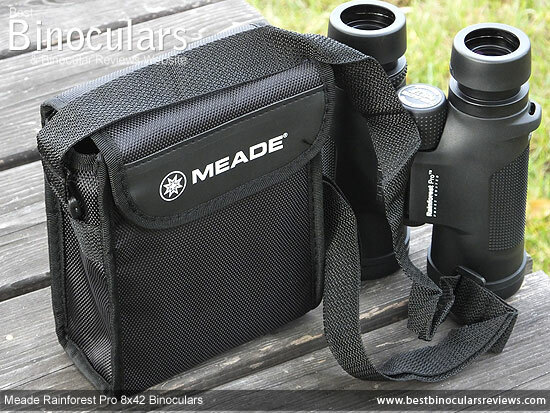 Black in color, the padded neck and shoulder section looks to be made from a Neoprene type of material which has the Meade logo printed on each end. It is nice and wide (5.2cm at the widest point) and fairly thick (approx 4mm). This along with a very slight curve assures a good and comfortable fit around the neck and shoulders. The thin straps that you thread though the loops on the instrument are made from what looks like woven nylon which is very typical. They come with the usual sliders so that you can adjust the length. The connectors that bind these thin straps to the main padded section are a faux leather, which look to have pretty decent stitching and so I doubt will break apart too easily. With a very typical design for a modern roof prism bin, the objective lens covers are made from a soft plastic/rubber and fit over the ends of each barrel. They are also attached to the bin with a separate loop that allows the cover to hang down below the barrel when you are glassing. This design is very functional and ensures that the covers are always on hand to replace as soon as you have finished using your bins, which in turn reduces the chance of your lenses getting damaged or dirty. On the negative side, the material that these Meade covers are made from looks a little flimsy and I doubt it would take much for the ring or the connector between the ring and the cup to break or perish over time. 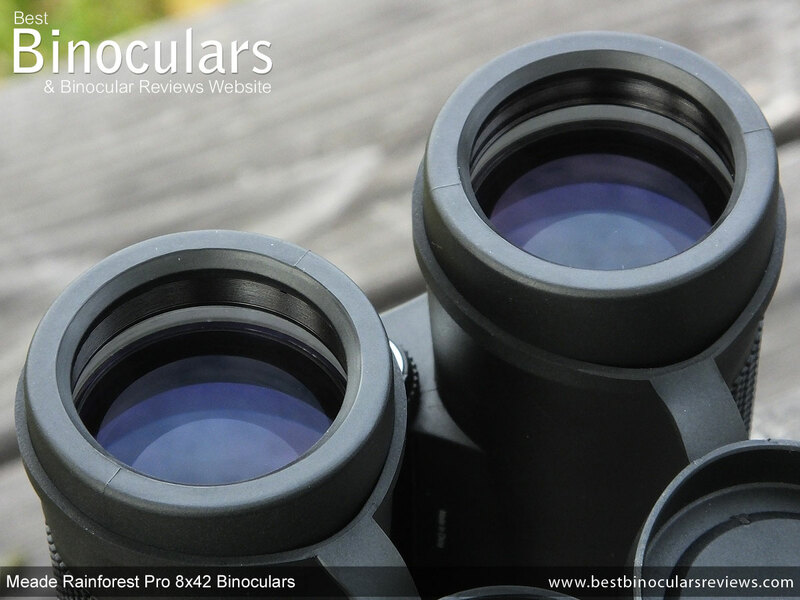 In terms of looks, the binocular has really smooth lines and a streamlined look to it that I really like, so it is a pity that this is slightly spoilt by the rather clumsy and bulky lens covers. A far nicer and cleaner look would have been covers that fit into the ends of the barrels, rather than ones that go over them. Very simple, but work perfectly well, the soft plastic/rubber rain-guard has a good fit over the eyecups and so is easy enough to replace, but does not fall away too easily. It has a flexible bridge connecting the two cups, so that it can be attached no matter your bins IPD setting and there are a couple of loops, which you can thread the neck strap though if you wish. The included cleaning cloth is like most, especially at this level - very basic and not made from a microfibre material and so in my opinion it should only be used for cleaning the body of the instrument. For best results and to ensure you do not mark the lens coatings, you will be better off by investing in a lens cleaning kit where even the cheap ones will perform far better. The Meade Instruments Instruction booklet is also very typical in that at first it looks comprehensive until you discover that it covers many languages, with each one spanning just a couple of pages. 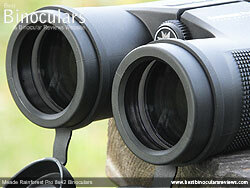 The very basics like parts of the bin, adjusting the eyepieces, eye-relief, focusing and cleaning are however covered. What is far more comprehensive is the Meade Limited Lifetime Warranty. Details of which are also included in the booklet. I think making a good 8x42 binocular at this price range is very difficult because not only is there a whole lot of competition, but as a manufacturer you have to make some tough decisions as to where you are going to make the necessary cutbacks in order to keep the price down. 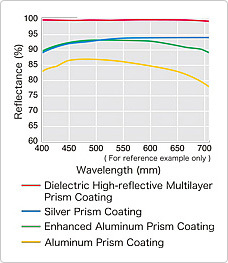 Strong Points: With phase correction coatings on the prisms and fully multi-coated optics, in terms of optical features, these contain far more than you usually get at this price. This really pays off as the image quality is very good and in my experience you will really struggle to find anything better at this price point, indeed as a whole, the image is a match for many that cost a whole lot more than these. Whilst it is true they may lack little things like the magnesium chassis, metal focus wheel and lockable diopter that you find on a good but expensive bin, but I bet you would never guess that it is as inexpensive as it is by looking or even holding them. 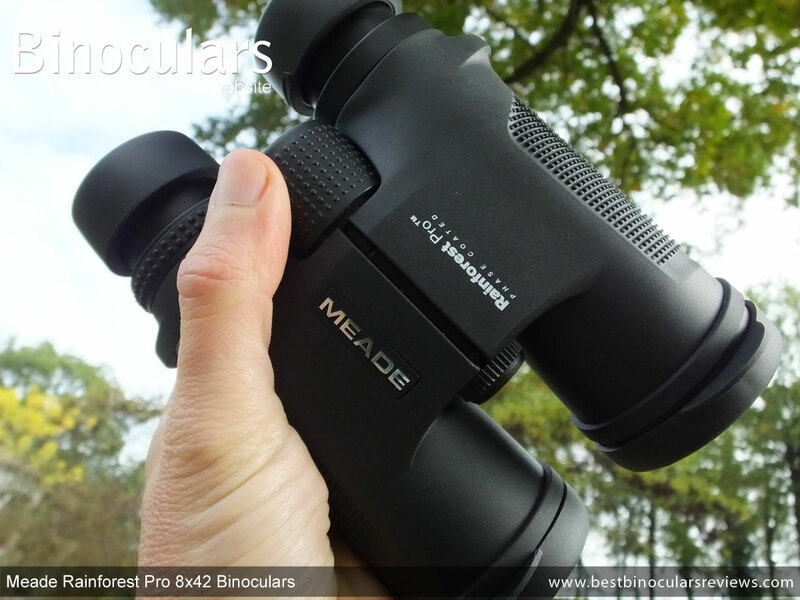 Not only is the Meade Rainforest Pro 8x42 binocular a great looking instrument, but from the use of a good quality rubber armour, they feel great as well. The field of view is very good, as is the close focus and whilst not quite what I would consider to be a very long eye-relief, the 17mm you get should be fine for the vast majority of eye-glass wearers. Weak points? Great features, specifications and components, at this price point, surely something had to give, but to be honest there really is nothing that is substantially weaker than that of their direct competition. 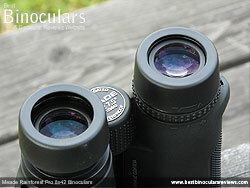 The objective lens covers are far from the best that I have come across, but they are also far from the worst. Likewise the carry case is not as refined as you would expect to get with a high priced instrument, but at this level it is not bad at all and functions perfectly fine. 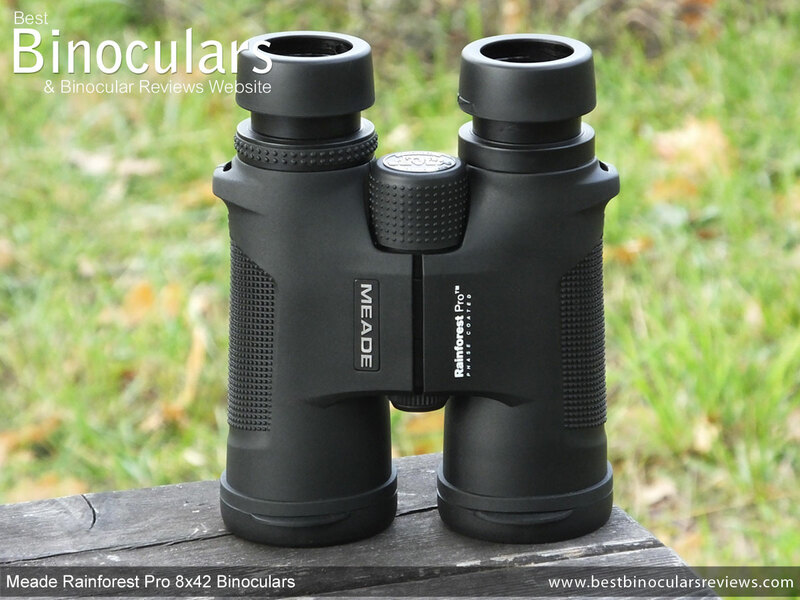 Overall - In the opening few paragraphs of this review and before I tested them, I wondered if the recent price drop of these Meade Rainforest Pro 8x42 binoculars which now places them in the low cost category would make them a great value for money binocular. Well the answer is categorically yes, in fact I would still rank them as being very good value at the mid level category. Whilst not perfect and lacking when compared to the very top tier optics, they are amongst the very few to have features like phase corrected and silver coated prisms at this price level and this really shows in the high quality image that they deliver. As a low cost binocular I highly recommend these as they are easily on a par with the best that I have used in this class.